The Dambuster Raids, or more correctly Operation Chastise is without doubt the most famous bombing mission of the Second World War (at least here in Britain). 75 years on everybody has heard about the bouncing bomb and the flawed hero pilot Guy Gibson. Most people, if they only know of one RAF Squadron, it will be the Dambuster 617 Squadron with their moto Apres Moi le Deluge (After me the flood). The raid is well known with lots written about it, but in brief, it took place during the night of 16-17 May 1943. Nineteen specially modified Lancaster bombers took off from their Lincolnshire base at RAF Scampton in an attempt to breach the Möhne, Eder, Sorpe and three secondary target dams around Germany’s industrial Ruhr Valley. The Möhne and Eder attacks were successful, the Sorpe Dam was a different type of dam requiring a different bombing technique and remained intact, and there was only a single unsuccessful attempt on the secondary target dams. Eight of the Lancasters were lost in the raid and 53 of the 133 crew members lost their lives. But the event, and a film made in 1955 (recently excellently restored) has immortalised them forever. The design, the bombing, the myth, the legend and the subsequent adulation is well documented, but the preparation and testing which made the raid such a success, less so. Probably the most famous training site where many people will associate The Dambusters is Derwent Reservoir in Derbyshire. It was used for intensive low-level night time flying exercises for about six weeks prior to the raid and used because the Derwent Dam resembled the Möhne Dam with its twin towers. The RAF regularly commemorate the part it played with regular flights of their historic Battle of Britain Memorial Flight (BBMF) Lancaster over the dam. On Sunday 21 September 2014 I like many was lucky to see the last two remaining flying Lancasters, one which had flown all the way from Canada, make 3 graceful flypasts together down the Derwent valley and over Derwent Dam. Impressive, beautiful and moving. In the past 617 Squadron have also made special visits, notably with Tornados, and the hope is that the recently re-formed 617 Squadron with their state-of-the-art F-35 Lightnings will keep up this spectacular tradition. At the dam there is a small memorial to the part it and until recently there was an excellent museum dedicated to the Dambusters in the west tower. But Derwent wasn’t the only reservoir used for Dambuster flight training. There are two other reservoirs slightly less well known but equally as important. Eyebrook Reservoir, (sometimes quoted as Uppingham Lake) between Leicester and Peterborough was also used by 617 Squadron for low flying practise. Although it’s dam was more like that at the Sorpe, scaffolding towers were erected to give it the appearance of the Möhne Dam. It proved excellent for honing their difficult bomb aiming skills. The BBMF Lancaster and 617 Squadron have been occasional visitors, and there is a metal plaque erected to commemorate the part the reservoir played. The third training reservoir was Abberton just south of Colchester as it was supposed to look like the Eder Reservoir from the air. It was used for final tuning of low flying techniques and was in fact used during the night of 14 May for a ‘full’ dress rehearsal for the raid. Of course, no practise aerial bombing was ever done at any of these reservoirs, despite a scene in the 1955 film showing attempts to hit floating target. Images of Mosquito aeroplanes testing bouncing bombs on land at Ashley Walk Bombing Range in the New Forest, and at Loch Striven on the Firth of Clyde are of the spherical Highball Bouncing Bomb designed for use against battleships and not for the dams. Similarly the rail track at Brean Down Fort in Somerset was for testing bouncing bombs for use against battleships. The Bouncing Bomb (in reality a mine) used for the dams was called Upkeep and like the Highball was designed by Barnes Wallis. The early design of the Upkeep was a cylindrical inner bomb surrounded by a spherical wooden casing. Initial bombing tests were undertaken in January 1943, using a modified twin-engined Wellington bomber in the Fleet Lagoon at Chesil Beach in Dorset and then with specially modified four-engined Lancasters at Reculver on the Kent coast. The use of an outer wooden outer casing was soon discarded, and the now famous cylindrical bouncing bomb was used for the raid. (Note: details of the Upkeep mine were only de-classified in 1963 so when The Dambusters film was released in 1955 it depicted, amongst other inaccuracies, a spherical and not cylindrical bouncing bomb). Final live aerial testing took place at the Wainfleet Firing Range off the Lincolnshire coast and off the Kent coast near Broadstairs. Several Upkeep mines are on display including one at the Imperial War Museum Duxford and others at RAF Scampton and the Herne Bay Museum near the Reculver testing site. Prior to the flying tests the early idea of Barnes Wallis’s bouncing bomb famously came from a marble game he was playing with one of his daughters. By the summer of 1942 this had developed into a large-scale experiment at the National Physics Laboratory (NPL) in Teddington where he tested shapes, materials and bouncing techniques in scale bombs in Number 2 Ship Tank. Here he was able to analyse the travel, the sinking of the bomb, the effects of water pressure and shockwaves and it’s where he developed the clever use of backspin to hold the mine against the dam wall as it sank. The same facility was used in making the Dambusters film in 1955 but Number 1 Ship Tank was used as it was better for the film crews to get the required angles for filming. Though NPL still exits at Teddington the Ship Tank facilities were sadly broken up in 1996. Even before the NPL testing, in late 1940 Wallis had taken his idea of attacking the Möhne and Eder Dams to the Building Research Establishment (BRE), or as it was known at that time the Building Research Station (BRS) near Watford where engineering teams had been studying the use of explosives on various structures. His idea obviously didn’t seem so farcical and it was decided that the best way to determine the requirements for explosive and best location to detonate would be to build an accurate scale model. Between November 1940 and January 1941, a 1/50th scale model of the Möhne dam was built across a stream in a remote corner of the BRS site. For added reality the majority of the dam was constructed of special miniature blocks to replicate as near as possible the original construction of the Möhne Dam, and an inner wall of clay replicated the Möhne’s earth embankment. After seven weeks construction, it took just less than a week for the miniature reservoir to fill and testing began on 22 January 1941. The tests consisted of detonating charges at various distances from the dam and at various depths. A probe on the dry side of the dam monitored the impact. After the sixth test the model dam was already leaking, and part of the parapet had been blown away. After the tenth explosion the model was so badly damaged it was no longer usable. The great news is that the model still exists in its original location and though it appears to have been repaired at some point in the past it is a testament to the incredible work that went on in preparation for the famous raid. In 2002 Historic England declared the model as being a historic monument of “not only of national but also international importance”. The success at BRS was followed by a series of further tests by the Road Research Laboratory – RRL (now Transport Research Laboratory -TRL) in Harmondsworth (close to what is now Heathrow airport). Here ‘simplified’ replica dams were constructed of cast concrete rather than miniature blocks and were used in a series of tests. Again, the results were encouraging, enabling them to calculate that to breach the full-size Möhne dam it would require 7,000 lbs (3,400 kg) of explosive detonated 30 feet (9 m) below the water level against the inside face of the dam. 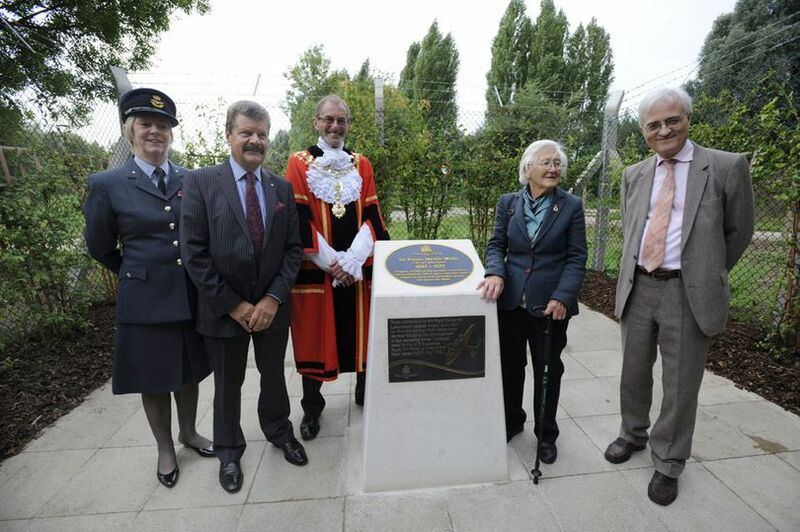 Sadly, none of the Harmondsworth model dams exist today but a plaque commemorating the involvement of the RRL in the tests was unveiled in 2013. The final destructive tests took place on a small dam near Rhayader in Mid Wales where the secluded Nant-y-Gro stream flows into the Caban Coch Reservoir in the Elan Valley. During the construction of the Caban Coch Reservoir a 180-foot (55m) long and 30-foot high (9.1m) dam was constructed across the Nant-y-Gro stream to supply the water needs of a navvies village and steam driven construction equipment. The Nant-y-Gro Reservoir contained over a million gallons of water but once the Caban Coch Reservoir was completed in 1904 the water from Nant-y-Gro Reservoir was no longer needed. The dam was still standing in 1942 and it was requisitioned for use by Barnes Wallis. Tests were undertaken in May 1942 but were not successful in destroying the dam. Following further development, a test was carried out on 24 July 1942 when 280lbs (127Kg) of explosives was suspended from scaffolding at the centre of the dam against the inner face of the dam at a depth of 10-foot (3m) and detonated remotely. The explosion blew a hole 60-foot (18m) wide and 25-foot (7.6m) deep. The remains of the dam remain today much as they were left 76 years ago though they are now largely overgrown with trees. The tough walk to see it is well worth the effort and there is an information board nearby giving details. Following the dams raid consideration was given to using the bouncing bomb on other targets. On 4 and 5 August 1943 five 617 Squadron Lancasters were used to test a modified bouncing bomb with a clockwise rather than an anti-clockwise spin for use against coastal defence systems. The idea of a forward spinning bomb dropped at sea was that it would take it further up the beach. The tests at Ashley Walk Bombing Range near Fording Bridge were considered successful despite the loss of one of the Lancasters which got caught in the wake stream of another Lancaster and crash landed (fortunately with no loss of life), but it was decided to abandon the idea. Between August and December 1946 three ex-Dambuster Lancasters (ED932, Guy Gibson’s, ED906 David Maltby’s, and ED909 Harold ‘Mick’ Martin’s) were brought out of storage and used for the disposal of the unused ‘Upkeep’ mines. In ‘Operation Guzzle’ the 37 remaining mines were dumped into the Atlantic Sea about 300 miles west of Glasgow. So, in summary there are still quite a few Dambuster ‘things’ still to see and I haven’t included details of Guy Gibson’s office at RAF Scampton, any remaining or preserved Upkeep mines, or the commemorative plaques in the UK, Holland and Germany.